In the world of big Hollywood movies, bad news tends to follow bad. 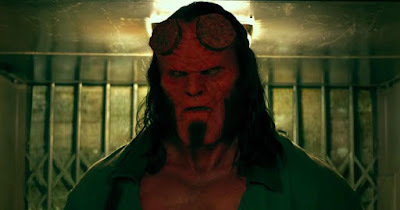 Poor box office or terrible reviews is usually met with a series of reports attempting to explain away what happened, and sadly that is the pattern for Neil Marshall's Hellboy reboot. Moments ago I added my relatively positive review to Rotten Tomatoes, which bumped its current critic score to a whopping 11%. Given the animosity some fans still have over the dismissal of Guillermo Del Toro and former star Ron Perlman this does not bode well, and a new story revealing behind-the-scenes turmoil will also be a problem. According to The Wrap, conflicts arose between Marshall, star David Harbour, and the movie's producers over creative control. In this kind of scenario the producers and lead actor will always in and Marshall saw his authority repeatedly questioned and diminished, beginning with the firing of his longtime cinematographer Sam McCurdy. That continued when Harbour and McShane were said to be changing the script for their characters, despite Marshall being against it. There was also some kind of beef over the look of the magical blood tree that plays a significant part in the story. Marshall wanted it to look one way, the producers another, but that seems silly in comparison to the aforementioned stuff and what came next. During post-production Marshall was basically locked out while producers took over control for themselves. Despite my favorable review, I noted the incoherence of the story and this may explain at least some of that. We definitely haven't heard the last of this. Stories such as this tend to linger and get worse over time. Surely, they'll never be as bad as that 11% score looks, though.